Nautilus Productions maintains a standard definition collection of Great White sharks breaching video. We have nearly a dozen clips of 14’+, 3000lb. 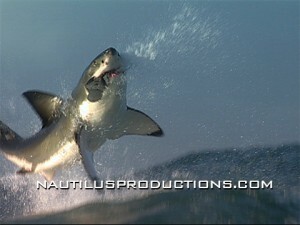 Great White sharks exhibiting breaching predation behavior. All footage is sourced on NTSC BetaSP and includes 15-25 second clips of the Great Whites attacking Cape Fur Seals or a towed seal decoy. This is truly amazing and unique video of the most fearsome of sharks as they jump and flip their way through unbelievable aerial attacks. THE WORLD’S BEST COLLECTION OF 4K & HD SAND TIGER SHARK VIDEO! This dynamic and growing collection of 4K UHD and High Definition Sand Tiger (aka Ragged Tooth & Gray Nurse – Carcharias taurus) shark footage is guaranteed to satisfy your needs for ferocious looking sharks in their natural environment. No cages, no chain mail suits and no chumming. Just BIG sharks and brave divers up close and in your face. Hours of video with just sharks, sharks with divers or sharks schooling can be yours. 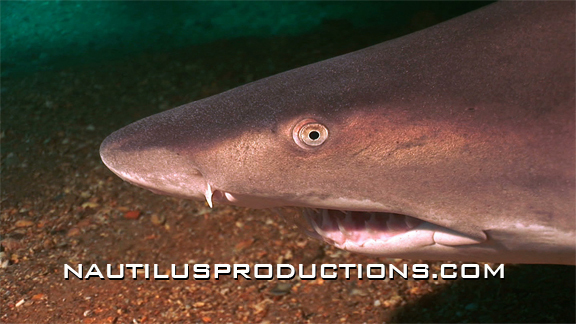 Nautilus Productions also has footage of Reef sharks, Nurse sharks, Horn sharks, Dogfish and who knows what species we will add to the list next. We’ve also got footage of Manta rays, Stingrays and Eagle rays – the sharks nearest cousin. Need video of scientists tagging and measuring sharks or commercial shark dives? We’ve got that too. Very simply if you need underwater expertise with sharks call us! We’ll dive right in. We’ll put a highly qualified shooter/diver on the bottom or in a cage. No problem! The posted video clips are only a very small sample of the footage in our collection. For a complete list of subjects, footage rates, offline clips or to request a time coded screener please contact us. If you don’t see what you need or would like a custom shoot please call. Our collection is always growing! Click to learn more about Sand Tiger sharks! Click on the “Search” tab below, call or contact us for specific requests or a timecode screener. Nautilus footage and images are registered under multiple US copyrights.